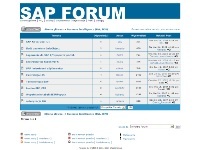 Details: SAP forums in Polish. The SAP Business Intelligence forum covers BW and SEM modules. Not very active however the users can find some information on SAP BOBJ BI 4, business intelligence, BW and integration with other systems.